Honey Dispensing Honey Pump for Honey Bottling, Honey Storage, Beekeeping. New Stainless Steel, Ergonomic, Anti-fatigue Thermo Guns™ and stainless steel nozzle for fast flow and customized for your needs. Control Box & Digital Temperature Control: allow you to accurately and precisely control and regulate your heating from -0° to 212° F/ 100 ° C. Built in fuses, saftey features and self-regulating heating ensure safety and long use. Digital temperature controller is easy to read and use and features a Liquid Crystal Display (LCD) to provide accurate, precise heating from -0° to 212° F/ 100 ° C, light-emitting diode (LED) to indicate On/Off status, easy fingertip-touchpad which has lockable feature and allows easy set up and adjustment of control setpoint, differential, and other functions, and is enclosed in either a NEMA 1, high-impact plastic enclosure or NEMA 4X watertight, corrosion-resistant surface-mount enclosure. 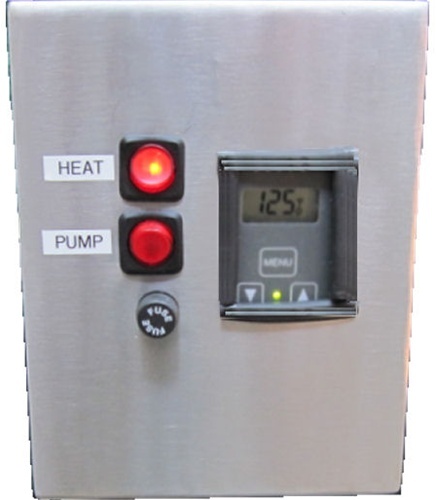 Also features single-stage, electronic temperature control with a Single-Pole, Double-Throw (SPDT) output relay and lockable front-panel touchpad for setup and adjustment, wide temperature differential adjustment range (1 to 30° F) to allow the user to set a precise (1° F) temperature differential from 1 to 30F°, adjustable anti-short cycle delay (0 to 12 Minutes in 1-Minute Increments) ensures that the output relay remains off for a user-set time delay, which helps avoid hard starts, nuisance overload outages, and unnecessary equipment wear. Thermo Pump: New Thermo Pump™ is Stainless Steel enclosed with heated, insulated stainless steel casing has 1" output. Thermo Hose: Our new Teflon® hose tubing is almost 50% thicker for safer chemical and heat transfer, faster transfer speeds and longer term use. At 120 Watts with self-regulating, high energy efficient coils, our new hoses can heat up more than 2 times faster than our former hoses and use less electricity. Newly designed, custom hose is 8' and triple insulated with a new safety sleeve which makes it lightweight and flexible, yet perfect for SAFE, FAST & Energy Efficient Heating. Our hoses are rated for continuous exposure temperatures of 250° F (121°C), but since our digital controllers limit temperature to a maximum of 212° F (100°C), degrees you have even extra protection and extended life. Hoses are wired with parallel circuit, low watt density electric heating with a conductive polymer core that with our sensors regulate heat output to prevent overheating, hot spots or causing burn outs in response to changes in surface and ambient temperatures. All hoses have a dielectric strength over 2000 volts and have internal stainless steel overbraid for additional mechanical protection and a low resistance path to ground as required by NEC 427-23. ELECTRICAL: Maximum(*) if on full capacity: 120V/60HZ, 155 Watts, 2.5 Amps. *Hose can heat up to 250° F but temperature keeps it below 212° F/ 100 ° C at all times. Stainless Steel Honey Dispensing System with honey pump for Honey Bottling, Honey Storage, Beekeeping, Beeswax Candle Making. Stainless Steel & Teflon Pumps, Hose & Gun! Fast controlled adjustable honey filling and dispensing with no air bubbles or dripping- a steady rapid safe and controlled flow. Control Box & Digital Temperature Control: allow you to accurately and precisely control and regulate your heating from -0° to 212° F/ 100 ° C. Built in fuses, saftey features and self-regulating heating ensure safety and long use. Digital temperature controller is easy to read and use and features a Liquid Crystal Display (LCD) to provide accurate, precise heating from -0° to 212° F/ 100 ° C, light-emitting diode (LED) to indicate On/Off status, easy fingertip-touchpad which has lockable feature and allows easy set up and adjustment of control setpoint, differential, and other functions, and is enclosed in high-impact resistant, thermoplastic NEMA 1X corrosion-resistant surface-mount enclosure. 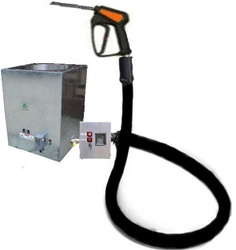 Heated stainless steel pump, Hose and stainless steel handgun keep your solutions heated and fluid during filling. Smooth Bore Teflon® heated hose which is chemical, temperature and shock resistant, while being lightweight, flexible, non-contaminating, non-adhesive and moisture and deterioration resistant. Simple and easy to set up and operate! An easy and virtually waste free self-cleaning mechanism.